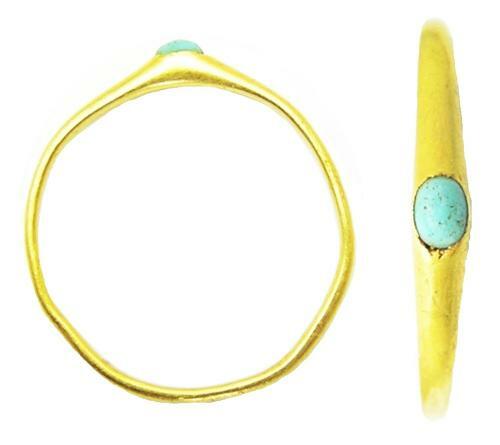 This is a medieval gold finger ring, dating to the 13th - 14th century. It is of the type known as a 'Stirrup' ring, named by Victorian collectors during the 19th century (due to the shape resembling horses stirrups). This example is set with the original turquoise gemstone, still secure and stable in a tightly rubbed setting. It is an elegant, well-designed ring suitable for a lady to wear. Turquoise would have been a highly prized gemstone, imported during this period from the Holy Land (around the period of the Crusades). It was thought that turquoise prevented one from falling from a horse, so useful whilst riding and hunting. A great looking jewel in excellent condition. DATE: c. 1220 - 1320 A.D.
PROVENANCE: Ex. private collection, Utrecht, the Netherlands.